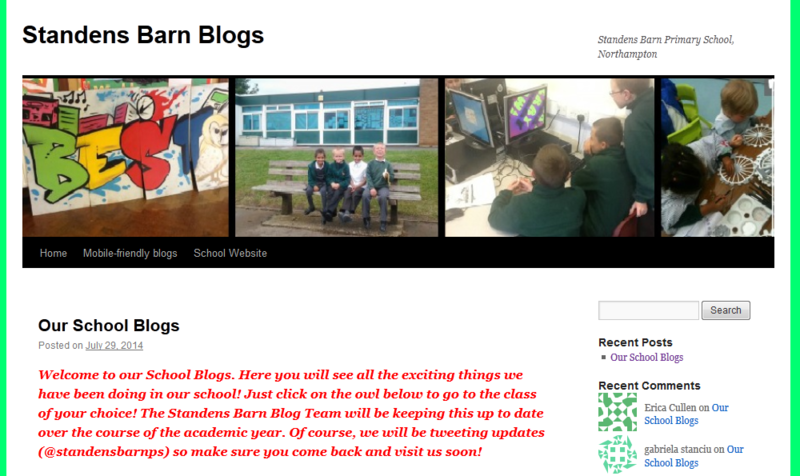 Lots of schools now have their own blogs where they share school news and learning and teaching ideas. Its a great way of allowing parents and other interested people a window into school life and getting some positive feedback and interaction for children. It also provides opportunities to write for a real and interested audience. Standens Barn Primary in Northampton has a great blog which you can access here. There is a blog for each class and also blogs for specific people or themes such as ‘Sports Reports’, ‘Mr Chalmers’ DLs’ and ‘Clubs’. I first became aware of this blog when Wayne Chalmers brought the school’s Digital Leaders to the University of Northampton for the afternoon to work some of our students who are STEM champions. (STEM is short for Science Technology Engineering and Mathematics.) We had an interesting inspiring afternoon of using ipads to photograph and film with round the campus, following a treasure hunt and then in pairs making a short film. You can read the university press release here and you can see the films here. Last weekend I was aware through all the tweets appearing that the BETT show was happening in London – a huge annual sharing of ideas and resources around educational technology. 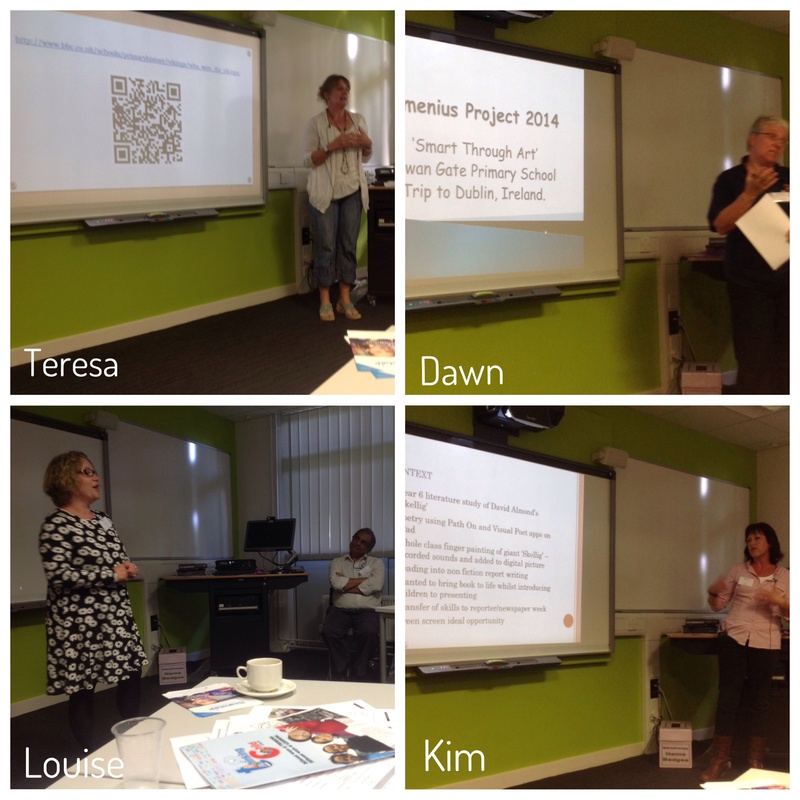 Then I saw some familiar faces as some of the Digital Leaders from Standens Barn and their teachers appeared! You can read about their visit here. And next week I’m looking forward to another post as I know they are coming to the #TeachMeetNorthampton2015 on Wednesday to share their ideas and experiences. There are lots of other schools who blog and I can see that Standens Barn Primary are making connections to other schools locally and further away. Its a great opportunity for the children to learn about the lives of other children. If your school has a blog and you would like to share it with us why not add it to the comments below? Or even better, write a little piece about it and I’ll share it here. #Nuture1415 is a social media based review of 2014 written by people involved in education. “So, it begins. Although to be fair I think others have beaten me to the blog. This is the third year of Nurture Blogging, which in the Twitterverse is like, forever. This is great opportunity for to read reflections on teaching and learning, lives in education and supporting learners. You can find many interesting (and moving) posts by exploring a list of links to them here or you can search #Nuture1415 on twitter to find links to blog posts. You might like to write your own #Nuture1415 – five positives from 2014 and five wishes for 2015. It can be a personal reflection for yourselves of if you wish, you can share it using #Nuture1415 or by posting a link in the comments here. 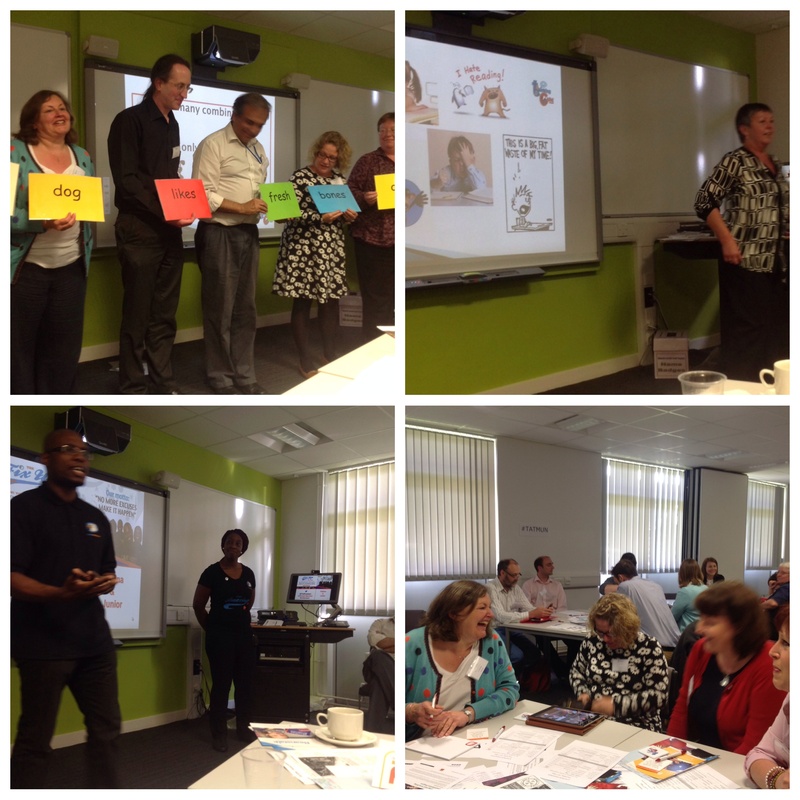 On Thursday 22nd May we held the first ever TeachMeet for Teaching Assistants (TAs) here at the School of Education, University of Northampton. Our aim was to use the ethos and structure of a TeachMeet and use it to allow TAs to share ideas, resources and enthusiasm for supporting learning. 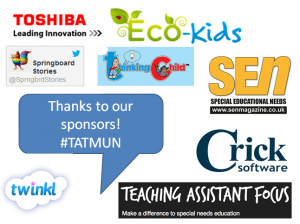 We were sponsored by a range of companies and organisations who support learning and teaching including: Toshiba, Ecokids, Twinkl, Thinking Child, SEN Magazine, Crick Software, Teaching Assistant Focus and Springboard Stories. They gave us things to give away, raffle prizes and contributions to refreshments for the event. these all added to the sense of fun and excitement at the event. At the event we had forty eight people, including teaching assistants and HLTAs from local schools and from further away including a party from Cambridgeshire. We had TAs and HLTAs who are also students on the FDLT course both Years 1 and 2. It was also good to see some of our applicants who will be joining FDLT Y1 in September. We were supported by staff from the School of Education including Julie Jones, Leader of the Education, Childhood and Youth Division and Wendy Yarnall, HLTA Programme Leader. Our FDLT Advocates were also present – April Bosworth, David Tristram and Chris Gilkes, talking to attendees about the course. The event was supported by Emma Stephenson, our Administrator and Stephen Bryant, our IT support who set up and managed a huge amount of IT including the bits I forgot, such as the guest login! Sue Dixon, from Thinking Child, who shared ideas around ‘What can we do when children have switched off to literacy?’; Kevin Hewitson from ACE-d introducing strategies to teach multiplication; Junior and Edwina from The Fix Up team who shared ideas about self belief and motivations ‘you are amazing’; Greg Yarnall from Beanstalk Reads telling us about volunteer reading in schools; Joy Judge who sent a Prezi outlining the role and support offered by TA Focus and Dr Estelle Tarry from the School of Education who shared her research about TAs in an international context. I gave a presentation about how TAs can use Twitter to made contacts and share ideas. As well as this we were well supported by our own FDLT students who took the brave step of volunteering (or saying yes to my invitation) to share their practice at the event. James Underwood, our compere, made the important point that these presenters had come along after a day of being TAs and HLTAs and were immersed in the day to day activity of supporting the learning of individuals and groups of children. Joy Davies – Everyone can have fun with geography! …and it was great to see a former student of ours, Dawn Parker, who shared a presentation about ‘Smart Through Art’ and the experience of her pupils from a special school taking part in European exchanges based on art. All the presentations were filmed and clips will be available soon, so if you weren’t able to come along you can view some of the event online. You can also look up the event using #TATMUN to see the tweets from before and during the event. At the end we evaluated using Padlet – a great classroom resource for class participation. We asked two questions – ‘what did you learn?’ and ‘what would you like to do next?’ We got some useful feedback and we’d like to build on the enthusiasm and positive reaction to this event in the future. Feel free to add any of your comments about the event – we’d love to know your thoughts now you’ve had time to reflect. 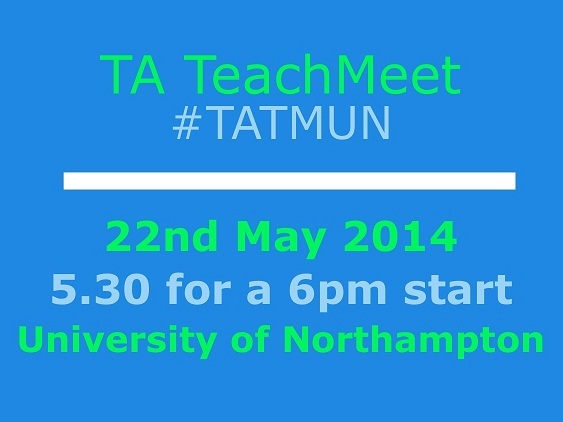 Plans and preparations are well under way for what we think is the first ever TA TeachMeet, here at the University of Northampton next Thursday (22nd May). The list of presenters is just being finalised and includes students on the Foundation Degree Learning and Teaching, people from organisations involved in supporting learning and TAs and some of us who work in the School of Education. 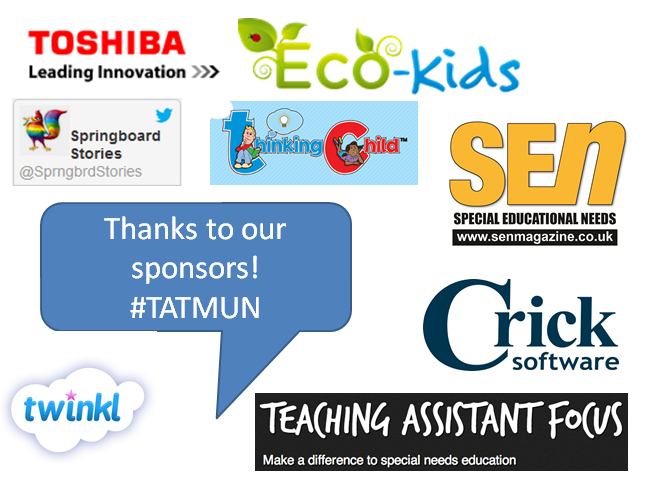 We’ve also got some great sponsors who have donated prizes and freebies including Toshiba, Springboard Stories, Crick software, SEN magazine, Abington Outdoor Classroom, TA Focus and Twinkl. 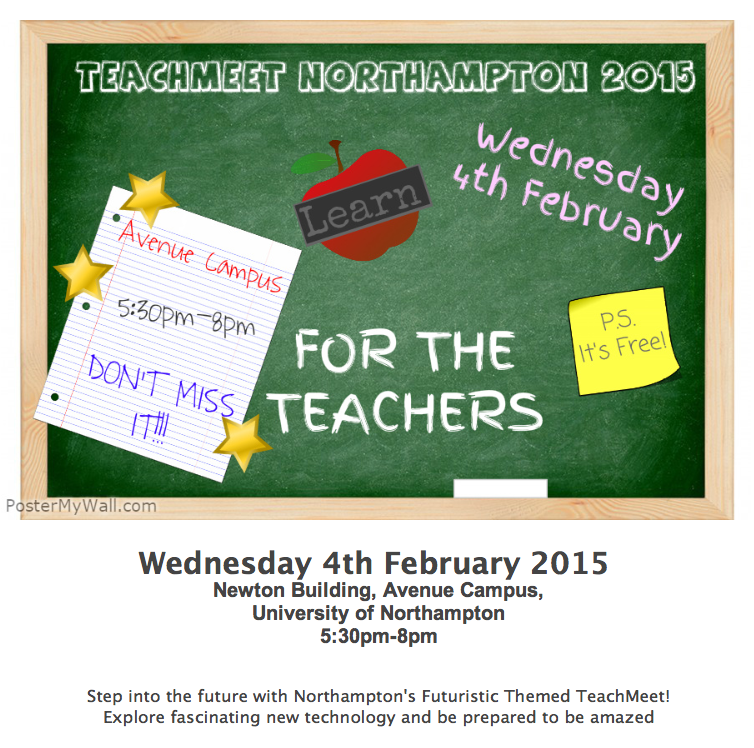 Introducing the first ever TA TeachMeet! 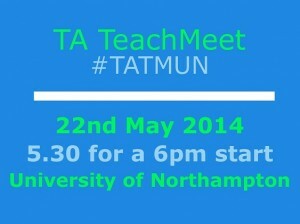 We will be holding what we think is the first ever TA TeachMeet here at the University of Northampton on Thursday May 22nd. A TeachMeet is an informal and positive celebration of and sharing of resources and good practice. If you are a TA, HLTA, Learning Mentor supporting learning in an educational setting please come along.